Well, hello blog. It’s been a long time. While this blog may have been dormant, I certainly have not been. I’ve done a few projects around my house and hopefully I’ll catch a second wind one of these days and write about them, but for now here’s a project I did outside of my house. The company I work for recently moved to a new building and I now have my very own office. I have a door! And windows! And a super random fireplace! As you can imagine, getting my own office is a big deal, not just because I got my own office, but because I got to decorate it as well. Considering I have this blog, you can imagine how exciting it is for me to have a new space to decorate. Here’s my office pre-makeover. Well, technically I did already have some influence on the space prior to these photos. 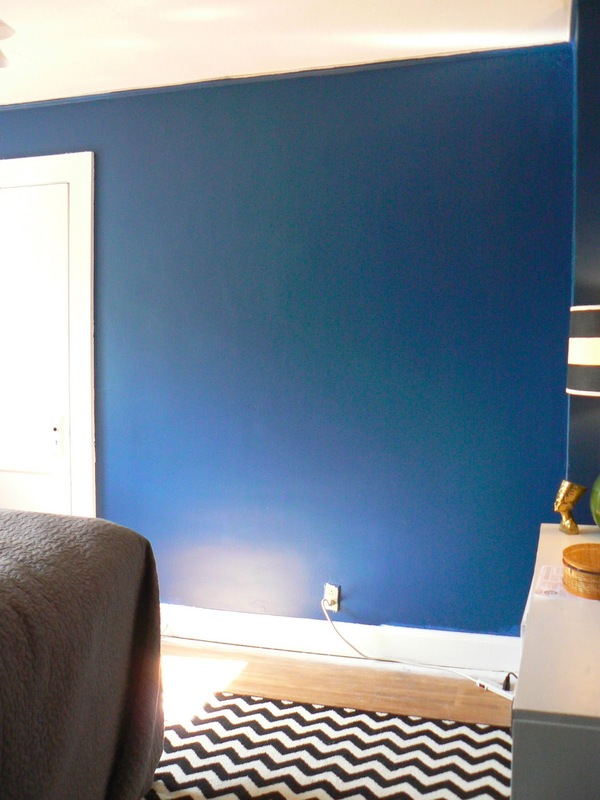 The owner was repainting anyway so I was able to choose the paint color, it’s Sherwin Williams Gauntlet Gray. 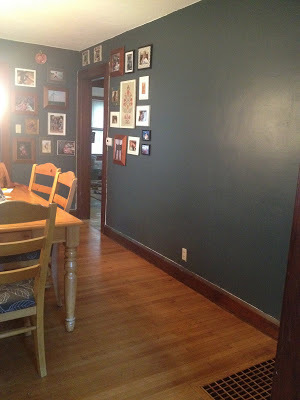 It’s a great dark gray (grey???). Why yes that is a random fireplace in my office. This office was at one point an apartment so I got what, I can only assume, used to be the living room. Here she is post me getting my grimy hands on it: Anyone else weirdly obsessed with taking pano photos on iPhone? They are so weird and useless and also look sort of distorted, but I still take them because sometimes you just can’t get the whole scene in a frame. I love the free ‘Dress Your Tech’ wallpapers from Design Love Fest, I highly recommend checking them out. 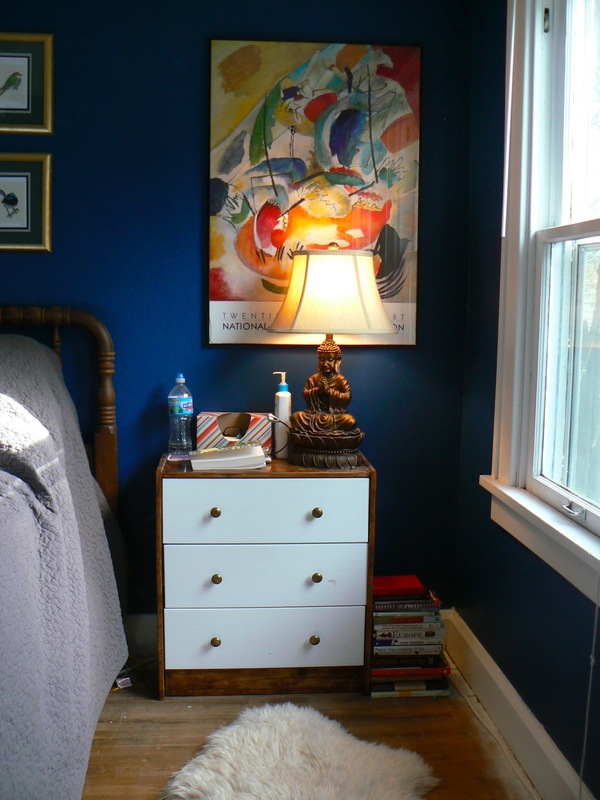 The desk and rug are World Market. The desk is probably too small for an office desk, but I couldn’t handle the idea of having a big boring (albeit super functional) desk. Of course, lots of cords because, you know, it’s a functioning workspace. The painting is from an auction and I’m obsessed with it. Soooo beautiful. It’s by a local artist and was painted in the ’30s. I got it for $50! Chairs are from the Container Store. Two boxes of Pantone postcards from Amazon and a lot of tape and I got this super cool (and super affordable) wall art. For my birthday last year my two best friends got me this awesome Rifle Paper travel calendar. When I was trying to come up with something to put on the walls in my new office, this calendar came to mind. Frames are from Hobby Lobby and I spray painted them gold (naturally). One of my brothers said it looks like a travel agent’s office, but I’m okay with that. 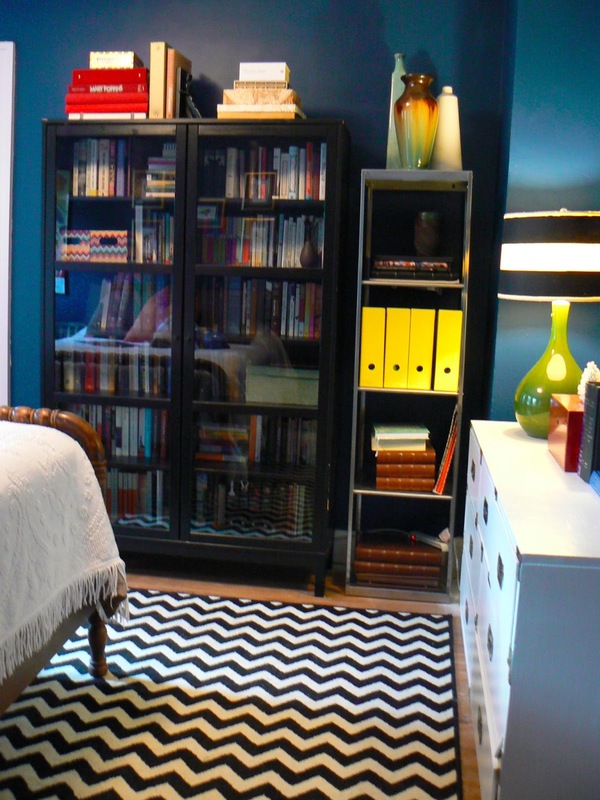 The long white bookshelves in the background are actually metal ones I found on craigslist (obviously). $30 for both of them! They were a total b to paint though. I tried spray painting them but that got out of control so I used a roller to paint and seal them. A total hassle, but overall a very affordable solution. Most of the stuff on them is stolen from my house. It was kinda fun to “shop” my house for things to bring to my office. I’m sure I’ll continue to tweak it because that’s just what I do, but for now I love it. Earlier this week I showed you my new bookcases. So great, right? I’m still in the unbelieving phase of having them. Whenever I turn the corner into the dining room I’m still surprised they are there. 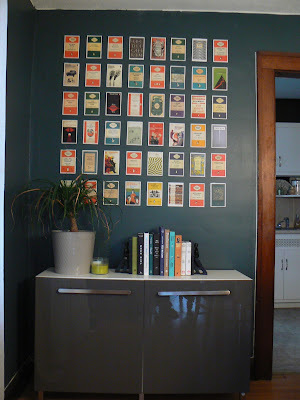 It didn’t take me long to start adding stuff on the blank walls around the bookcases, I mean, this is me, if I see a blank wall I’m going to nail crap to it! You may recognize these bird prints with the frames that I gilded, as the ones from my bedroom. I have a good reason for moving them out of my bedroom, but I’ll get to that in another post. I only used four of the five prints because only four of them are vertically aligned. 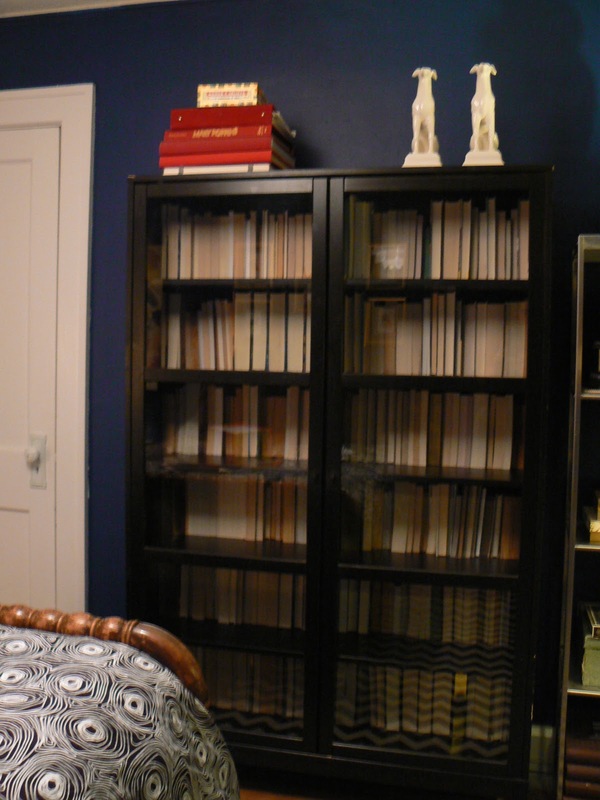 I also decided to level the top picture with the door frame and not the bookcase. 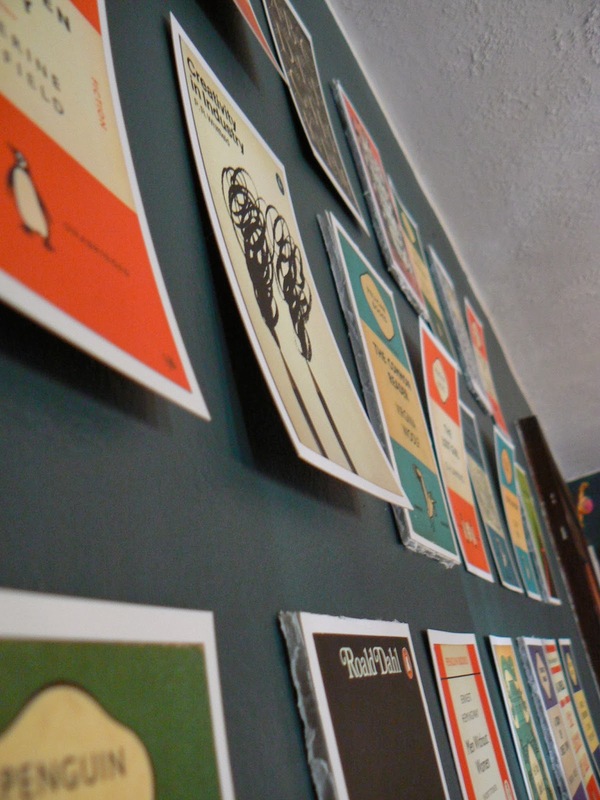 That was a decision based on the fact that the postcard art is also level with the top of the doorway. I think it helps make the room look taller, but I don’t really have evidence to support that. You can kind of see what I’m talking about below. I really like them there! It’s nice to move art around within the house because it helps me to see them with new eyes. It’s also nice because most people don’t come over and hang out in my bedroom so now these prints get more exposure. I haven’t quite decided what if anything will go in these places, but of course, I’ll keep you updated! I’ve loved books my whole life. I started collecting them even as a kid. I recently found a picture of my first set of grown up bookcases. I got them when I was 13 and it was such a big deal! It’s all so teen – the Christmas lights hung year round, the collector edition Barbies, all the candles. It makes me so happy that I took pictures of them when they were like that. 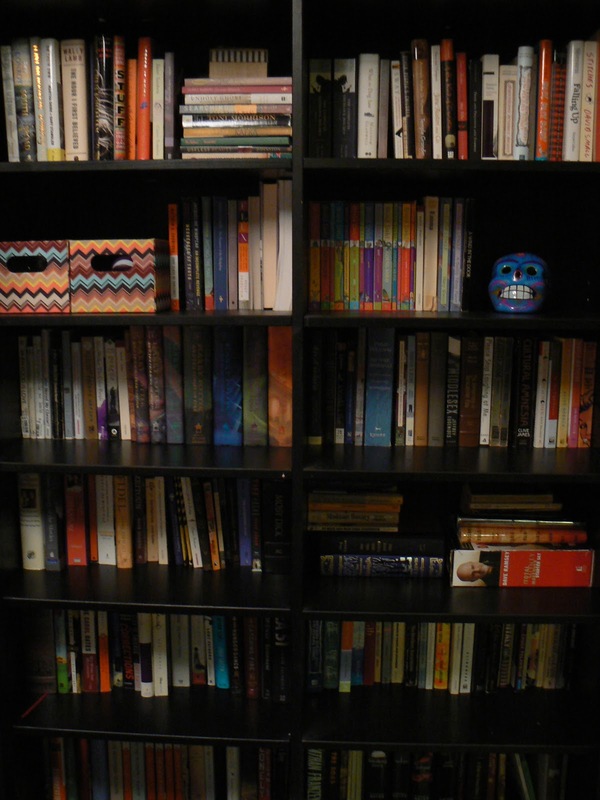 One of my favorite activities was to take all the books out and then reorganize them. That’s not a joke, I really did love to do that! 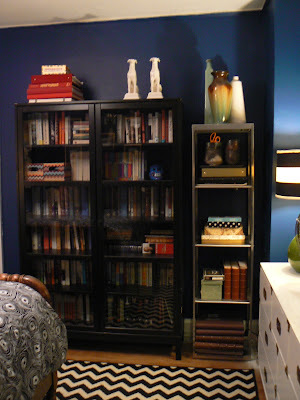 But back to present day, I’ve been in the market for bookcases for about two years now. 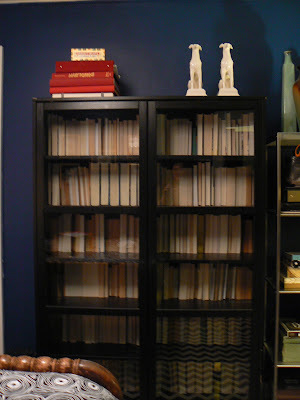 I’ve been like a broken record about my ‘dream bookcase‘ but I actually finally got one! Technically, it isn’t my ‘dream bookcase‘ but I’m okay with that. The bookcase I wanted was 8 feet tall by six feet wide with glass doors and was $560 (which is pretty insane considering it is just particle board). The bookcase I ended up getting is 7 feet tall by 6 feet wide with no glass doors and was only $150!! So, I lost a foot off the top and glass doors, BUT I’m happy that I didn’t ‘invest’ in something that isn’t real wood. If I’m going to spend over $500 on something I want it to be a good quality item that will last a long time. 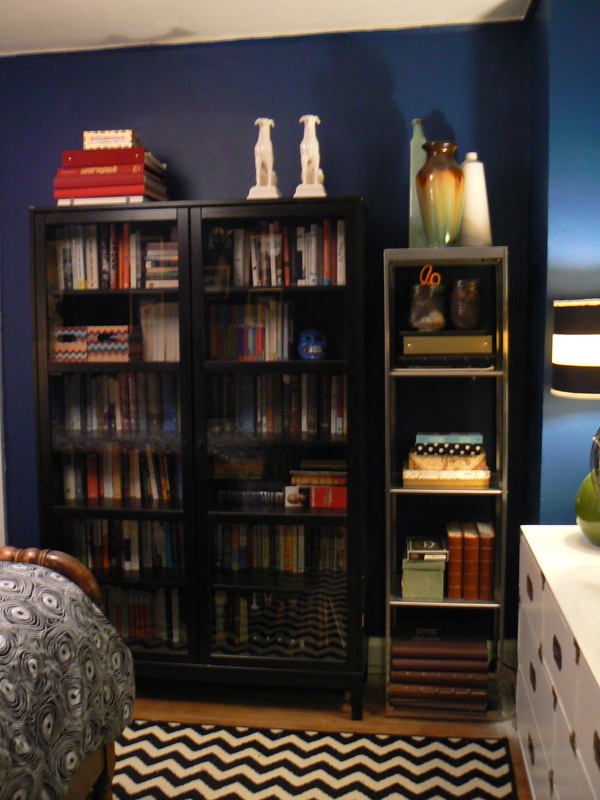 And here are my three new bookcases! It is so nice to have all of my books out and in one place! My old black bookcase in my room only held about half of my books (the other half were in tubs in the spare bedroom). 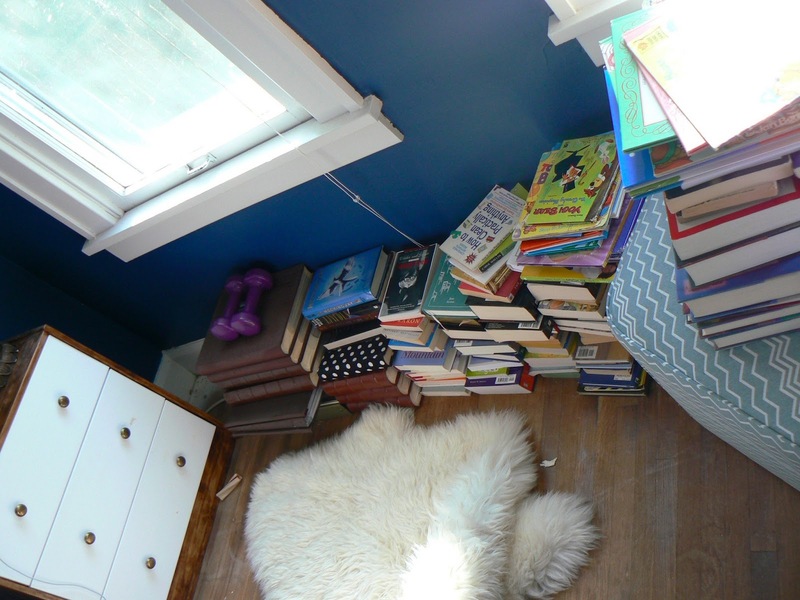 Then there was the last 10 months where my bedroom floor became a makeshift bookshelf. Now finally, my books are displayed nicely in one place. Right now the walls on both sides and the top of the bookcase are bare so we’ll see if I had stuff later. 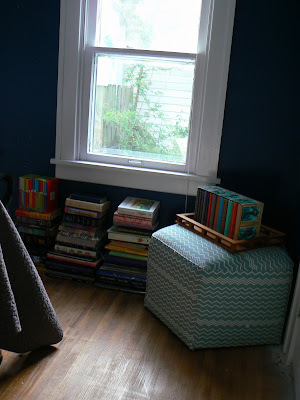 For now, I’m just happy that my wandering books have found a home. 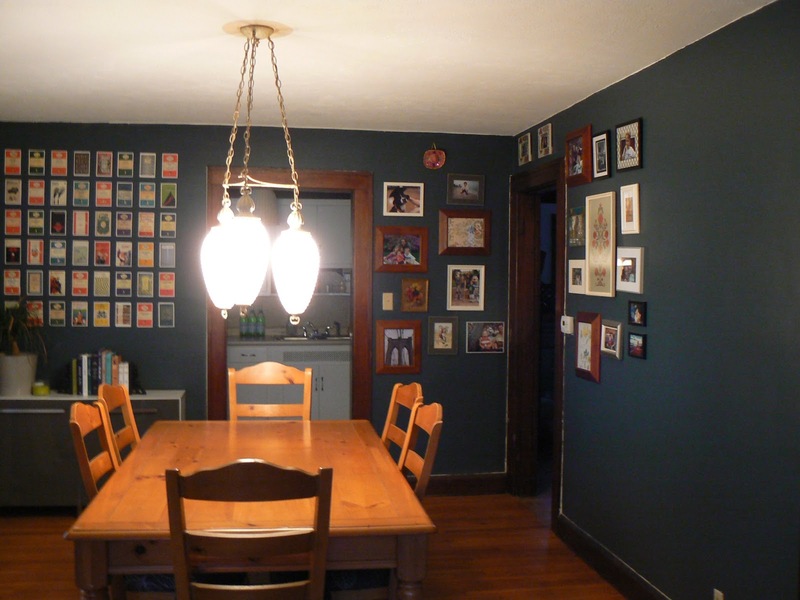 This is my dining room as of September 2013, enjoy! All photographs are courtesy of Ashley a. Photography, thanks Ashley! 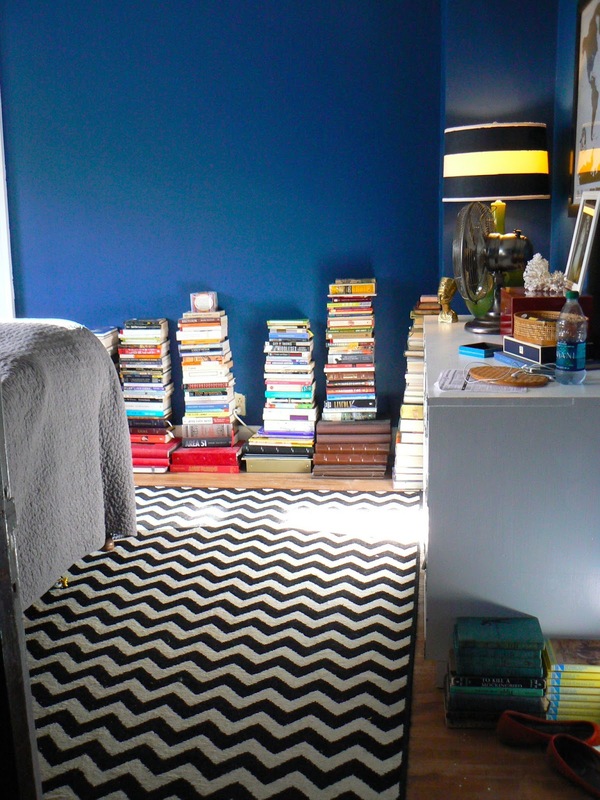 This is my bedroom as of September 2013, enjoy! All photos are courtesy of Ashley a. Photography, thanks Ashley! This is my kitchen as of September 2013, enjoy! It’s been 10 months since I installed my DIY Postcard Wall Art so I thought an update was in order. 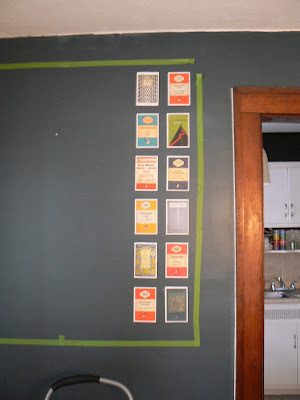 If you haven’t read the post where I installed it, it was a pretty easy process. But since I was doing something new-to-me I had no idea if it would actually have staying power. The good news is that it still looks great and I really like it! And thankfully there is no real bad news. The only behind the scenes maintenance I’ve done is to stick back up a few that have fallen down. Almost all of them were originally stuck on with 3M stickers but I ran out of the stickers towards the end so the rest just got scotch tape. A few months later I added 3M stickers to those without them. The few that have fallen off since have been the ones that only had scotch tape or ones that are on bumpy or cracked parts of the wall (because my walls are plaster there are more imperfections than on drywall). Wondering what that new little white box in the corner is? It’s a motion detector because I’m super fancy like that. 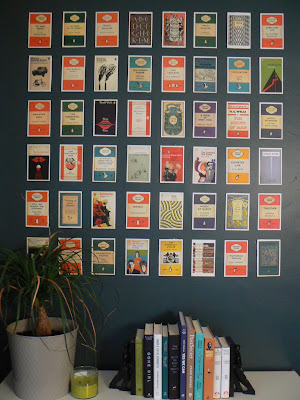 Oops, there are a few crooked ones, but oh well, it adds to the DIY charm. It’s been rainy and humid here the past few days so I’m wondering if that has anything to do with it but several of the postcards are starting to curl away from the wall. Some of that has to do with the fact that on a lot of the post cards I only put one 3M sticker right in the middle (during installation when I realized I was running low on them I started to only put one on as opposed to two). So some of that would be cured by adding a new sticker. But also, I don’t hate it. Of course, if they all start falling down then it’ll be an issue, but until then I sort of like the added texture. That was the whole reason I added foam core the the back of some of them in the first place. It seemed like it would give the look dimension but it ended up not make much of a difference. The curling postcards definitely do give the look more dimension though so I’m happy for now. Overall, I highly recommend this project! It was extremely cheap to do ($15 for the postcards and around $20 for other materials) for the impact it has and it was very simple and fast (it only took me about two hours to do, way less if you skip the foam mounting part). I mentioned in my last craigslist post that I recently sold three things, I sold the red chair and glass coffee table from the living room but I’ve kept mum about the third thing until now… I sold the black bookcase in my bedroom! 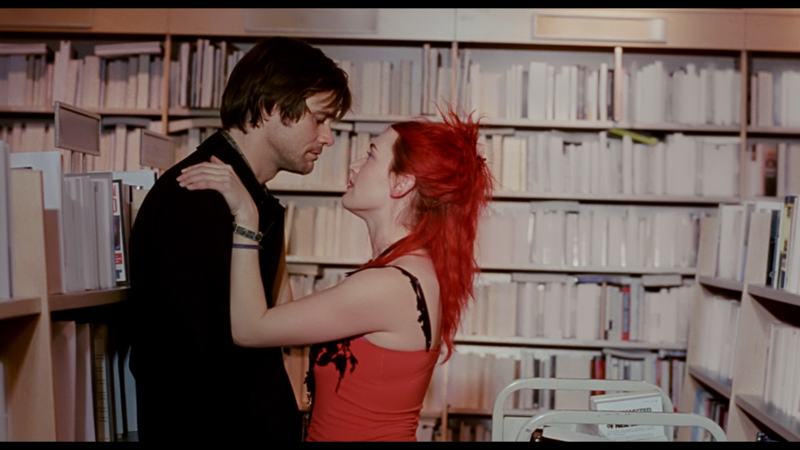 I’m actually really sad about it because I loved that bookcase. I’ve said it like a hundred times but this bookcase sort of changed my life (more on my books obsession here). 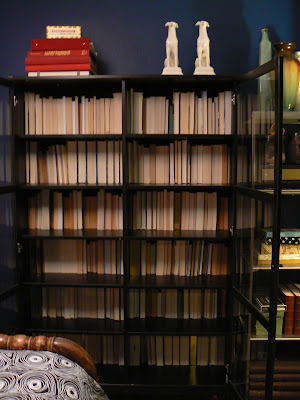 Now that I know the glories of having glass doors on bookshelves I can never go back (no more dusting book pages!). So why did I sell it? Well, that’s a bit of a long answer. I’m at that point in my home decorating where things get weird. My house looks done and most people would be content to leave it where it is, but not me. I have a big vision for this house. Which means, I am now starting to replace the ‘place holder’ furniture. Unfortunately, that includes this black bookcase. While I loved this bookcase, it did not go well with the paint color in my bedroom (it was too dark against the blue wall) and I there wasn’t another place for it my house. Plus, I have plans for a bigger and better bookcase. 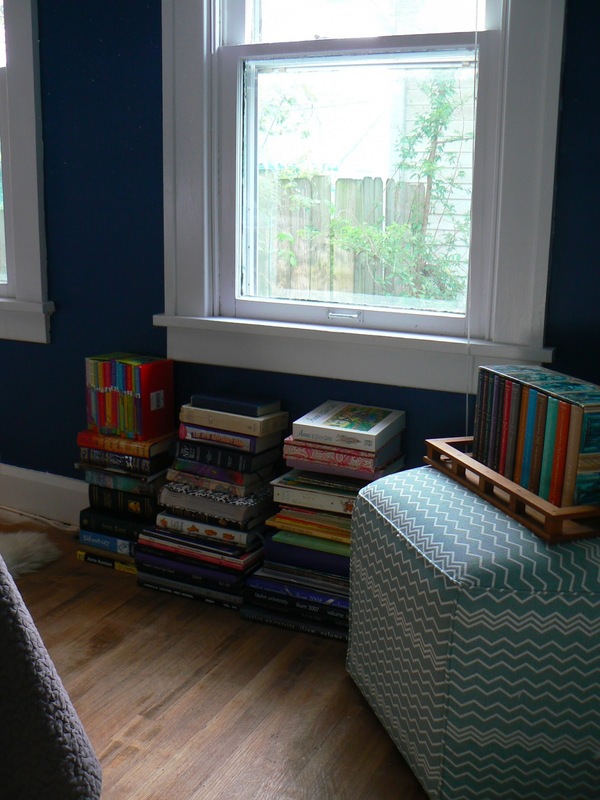 I’ve literally been talking about my dream bookcase for like nine months (here) now but selling this bookcase gets me one step closer to actually buying it. That big wall to the right (it’s bigger than it looks, from the end of the frames to the corner of the room is about 8′) is where the new bookcase will go. 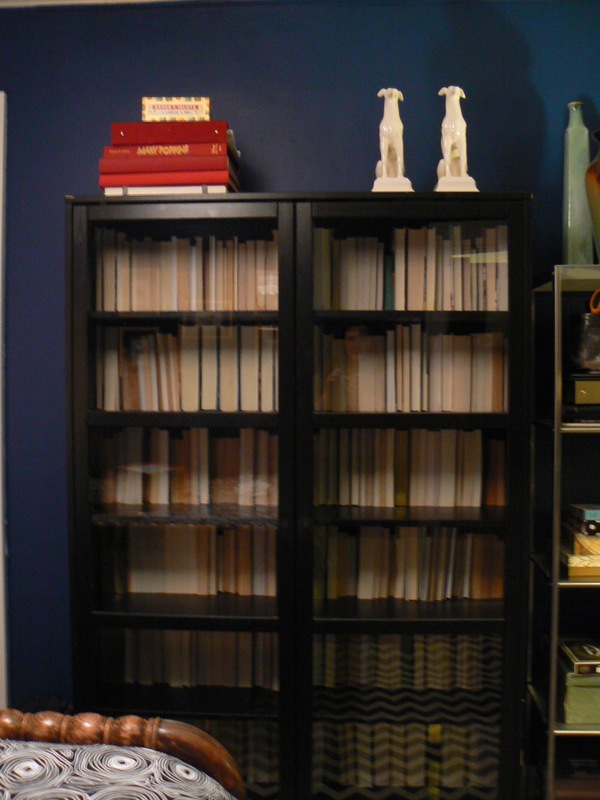 So the bottom line is this: I sold the black bookcase so I can use the money to help buy the bigger white bookcase for the dining room. The other side of my room was cray. I own a lot of books. 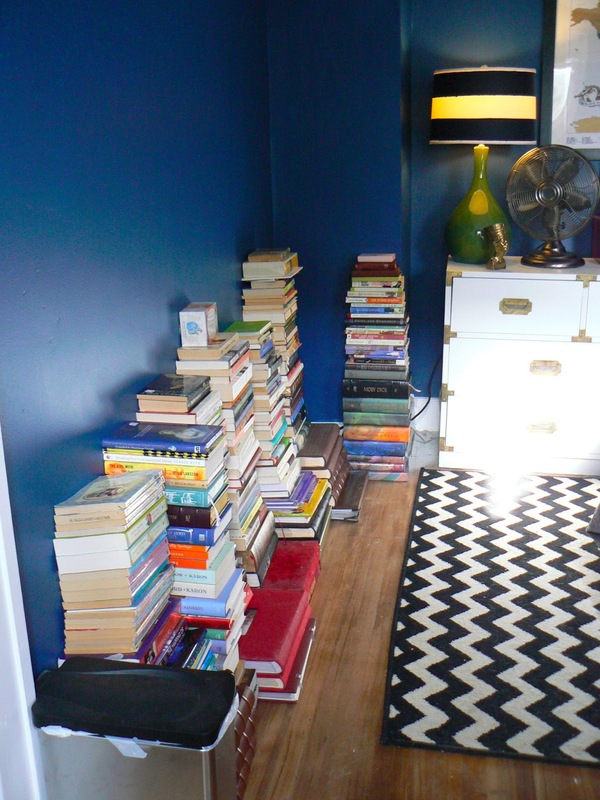 What you may not be able to see is that there are three large tubs hidden under there full of books. Yeah… I have a lot of books. Since I haven’t planned my trip to IKEA yet and I don’t want to leave my books like this any longer (it was sort of suffocating in there) I came up with a temporary solution. I’m going for a sort of 80-year-old-professor-of-English-Lit-who-has-traveled-the-world-and-been-married-seven-times vibe. Are you feeling it? Now that I think about it, said woman would probably have more Proust and less young adult fiction… ah, well. I started by stacking the big books first, mostly photo albums and yearbooks (why do I keep those?). Then I gradually added books. Here is the view from the doorway. It feels so open in there now! I’m sort of loving it. I don’t have plans for that wall yet. 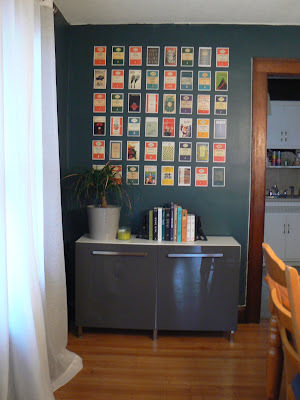 My goal is the get the bookcase for the dining room, move these books onto the dining room shelves, and then deal with this wall. I stacked these up yesterday and so far Bob hasn’t bothered them. 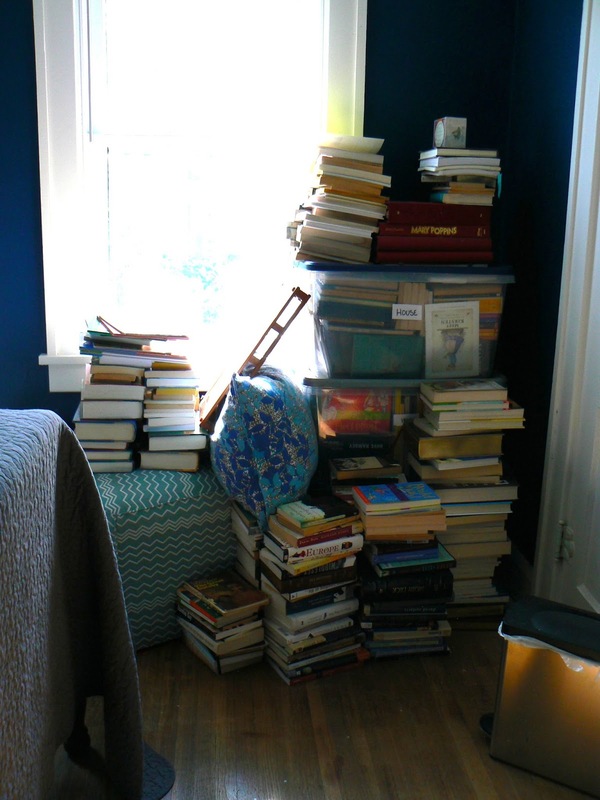 The likelihood of one of these stacks falling over is high, I mean it is just books stacked up like three feet high so yeah, not foolproof or anything, but so far so good. The overflow is still in the corner, but it is much cleaner now! I also added a little stack by my nightstand of the books I haven’t read yet. 1) Will I read it again? The answer was ‘yes’ a surprising amount of times. There are about 30-ish books that I re-read regularly, as in either once a year or bi-annually. 2) Is it pretty? A shallow question, but some books are just so pretty that I had to keep them. I have a lot of very beautiful books that I probably won’t ever read again, but they are pretty enough to keep around (to use for styling). 3) Is it sentimental? A lot of my books have sentimental value. Either they were gifts from loved ones, books from my childhood, or they remind of a specific time in my life. People are sentimental about all kinds of things and I am sentimental about books. So that is my ‘in progress’ update on the bookcase situation. I’ll keep you posted! I’ve mentioned many times how much I love bookcases, especially the kind with glass doors like the one in my bedroom. But lately, I’ve really let my bookcase go. Stuff was just piled in there willy-nilly like it was a closet, except you could see through the doors. This is a still from Eternal Sunshine of the Spotless Mind which is an excellent movie if you haven’t already seen it (and even if you have seen it you should watch it again because it gets better every time). See behind them, how the books are all turned around? In the movie it is a metaphor for how their lives are all turned around or how blank their memories are or just because it looks cool. 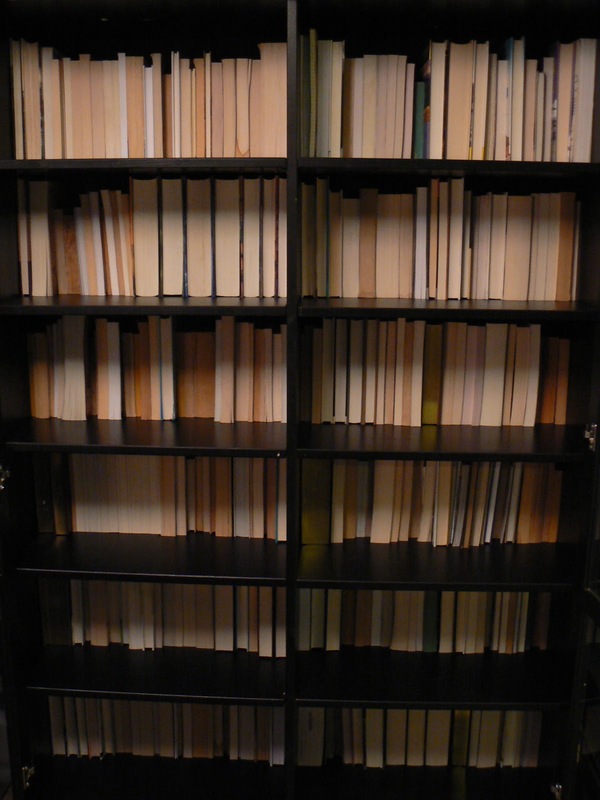 I decided it would look cool if I did that to my books too. 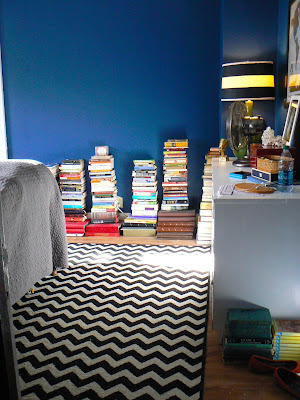 This look works especially well in this room because that black bookcase again the dark blue wall is a really heavy look. I will eventually switch it out for something lighter but for now this gives the illusion of lightness. My apologies for the shadowy pictures. It is always dark when I get home from work so it’s hard to get good sunlit pictures. Welcome, YHL readers! Thanks for visiting! 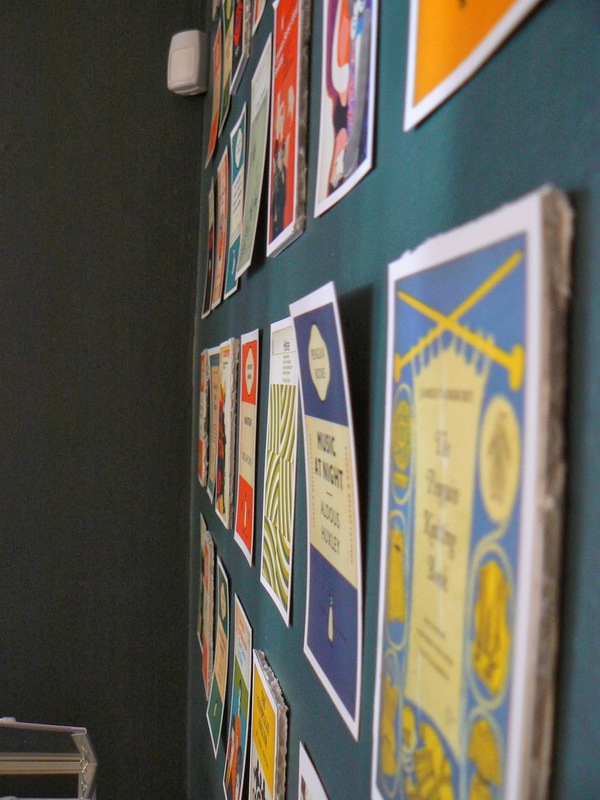 I love YHL’s new book and I am so happy to share a project that was in part inspired by their Project #28: Collage Your Wall. This weekend I got on a project that I’ve wanted to do for a while. If you can’t tell from the image above, I used postcards to create large scale wall art. I love it! 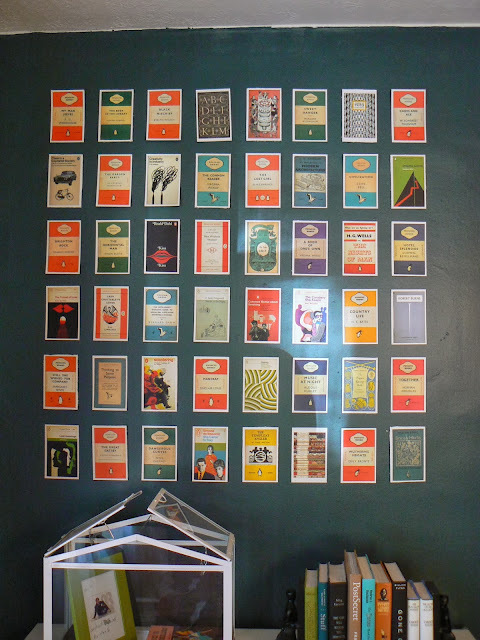 It all started nearly a year ago at Christmas when I got a set of postcards with book covers on them. 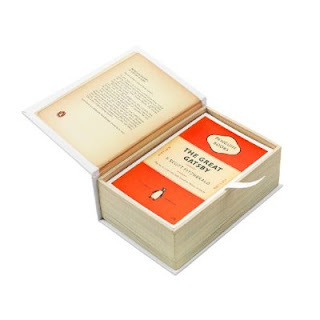 The set of postcards I got are Penguin Book covers that range from The Great Gatsby as shown above to some super obscure books like Common Sense About Smoking. Ironically they sat on my bookshelf for a year. I tried a few small projects with them but nothing really turned out. 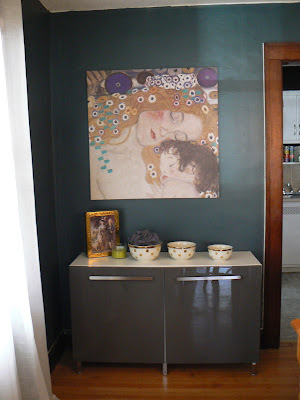 Then a few weeks ago I decided I was a little tired of my Klimt canvas. Don’t get me wrong, I still love this piece. 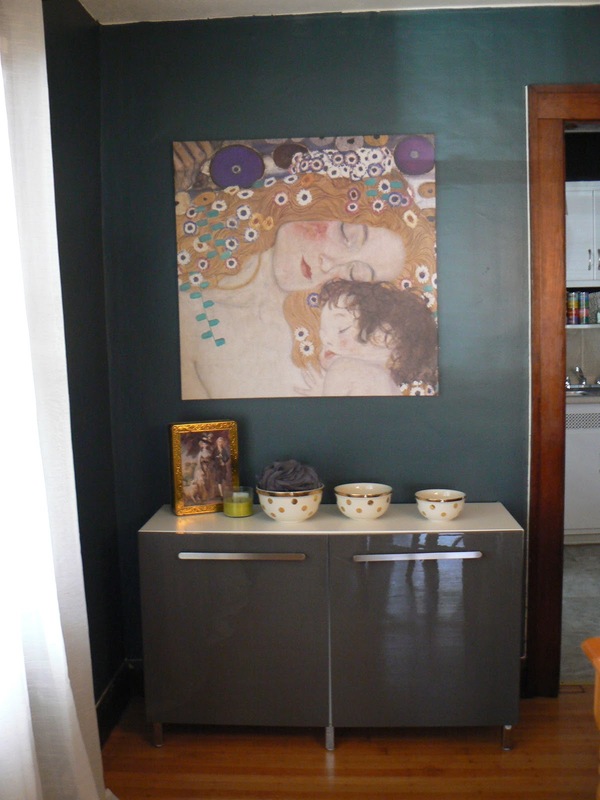 I’ve been a fan of Gustav Klimt since high school (in college I even named my beta fish Gustav in homage) and when I saw this large print at IKEA I had a rather visceral reaction to it. But it was time for it to move to another part of the house (yet to be determined). So that is when I decided that maybe doing a large wall of postcards would be cool. 1) In order to give the overall look more texture I mounted several of the postcards on foam core. I used rubber cement to adhere them. I randomly decided that I wanted 25% of the total amount of postcards to be mounted, which for my wall came out to 12 postcards. 2) After they dried I used a utility knife to cut them apart. The utility knife left a pretty rough edge so I used scissors to clean them up. 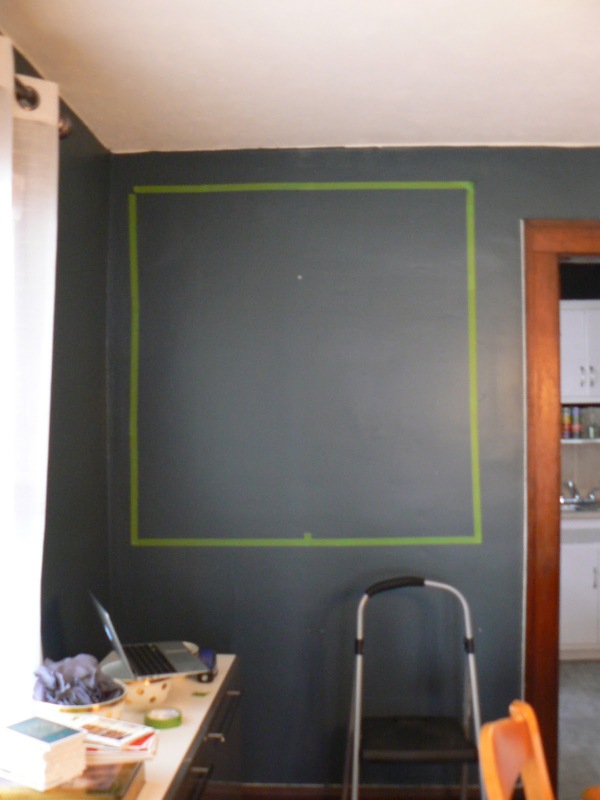 3) I measured out the area I wanted on the wall and marked it with FrogTape. 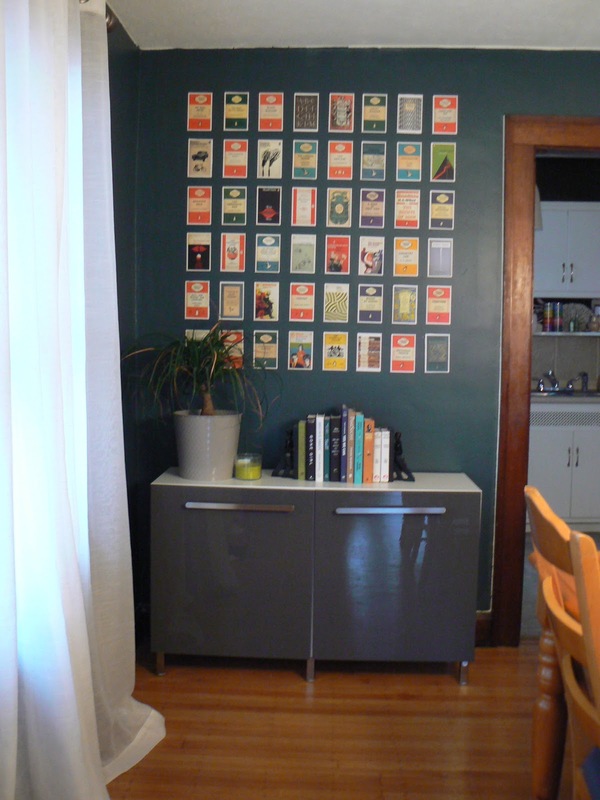 For this space I decided on 4’x4′ which is 48 postcards with about 2″ in between each one. If the tape looks crooked to you that’s because it is. I was using it more as an idea of where I wanted them to go not an actual starting point. As I’ve mentioned before, I am not good at doing tedious measuring so once I had the first row done I eyeballed the rest. The first row I did by using my level to make sure everything was straight and then as luck would have it the level was nearly 2″ wide so I used it mark the distance between the postcards as well. I spread out the twelve that I put on foam core randomly. When it was all said and done I could have easily skipped the foam core stage and just put them all on the wall flat because the foam core didn’t add enough dimension to make much of a difference, but I’m glad I did it because I would have always wondered if it would look better with some mounted. 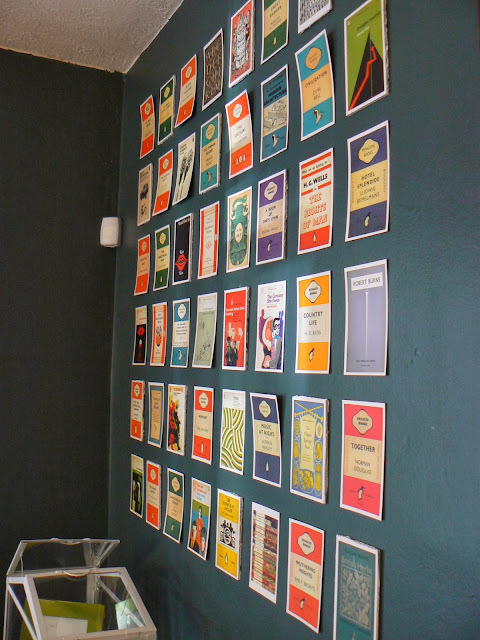 This project would also work well with any other kinds of postcards, like these awesome Pantone ones, your own personal collection of postcards, or vintage ones collected from antiques stores or from pre-collected sets on Ebay. I love checking things off my mental to-do list!